The Property Nerds "We Engineer Happiness"
There were almost too many political, economic, social and even ecological factors impacting the 2018 market in the Bay Area to count. 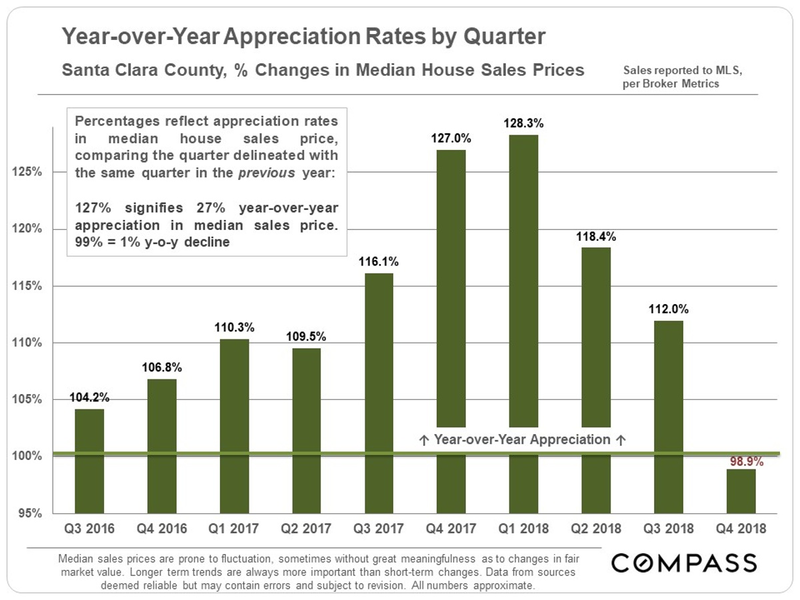 At the end of 2017 and in the first half of 2018, market conditions in Santa Clara County were about as hot as they’ve ever been, and there were staggering year-over-year appreciation rates. Come summer/early autumn, real estate and financial markets began to shift distinctly cooler. There are a lot of spinning plates right now – locally, nationally and internationally – with the potential for both positive and negative impacts on local housing markets: volatile financial markets (and local-company stock prices), fluctuating interest rates, contentious national politics, international trade issues, migration trends, spiraling debt levels, employment growth – and a surge of local high-tech unicorns that plan to go public, which could create a tsunami of new wealth in the Bay Area. All this should make for another interesting year. 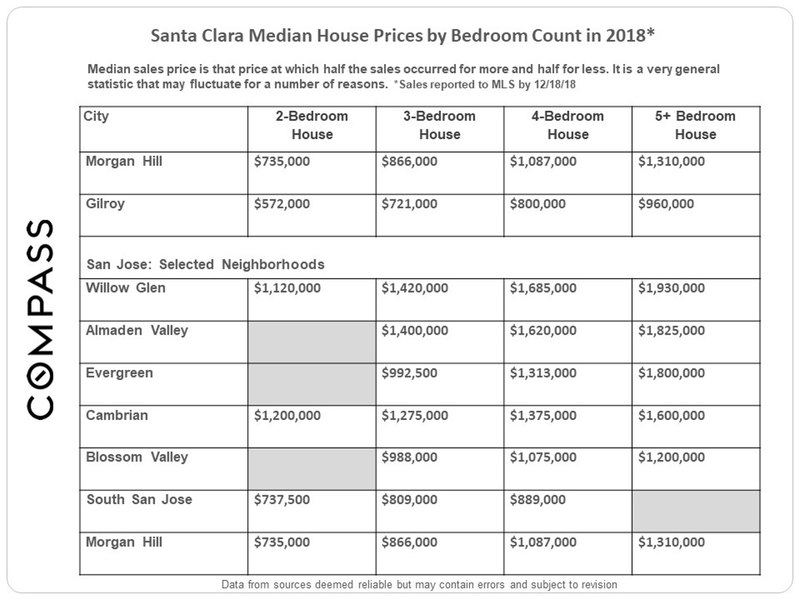 Year over year, the median house sales price in Santa Clara County in 2018 increased $155,000 or 13% to $1,335,000. The appreciation picture changes considerably if we look at y-o-y quarterly rates. 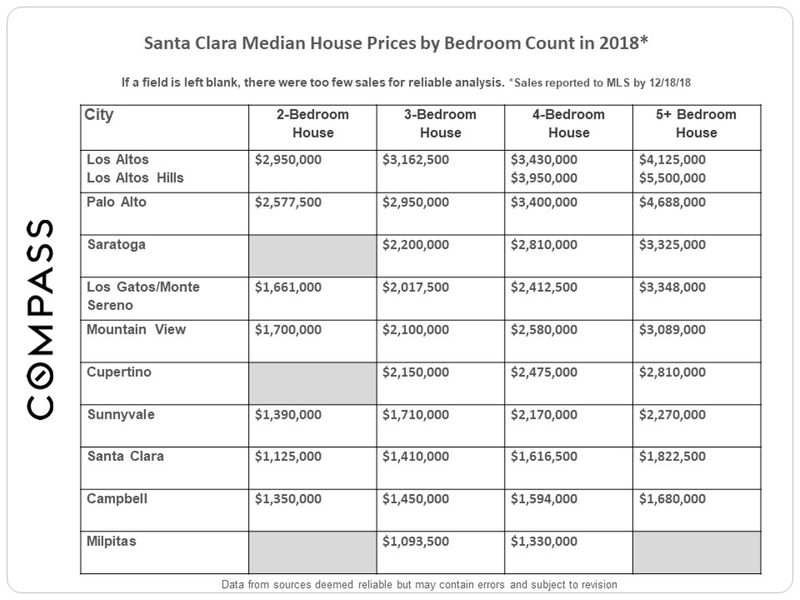 In Q4 2017 and Q1 2018, Santa Clara may have had the highest home price appreciation rates in the country. Q2, the spring selling season, was also a very strong, competitive market. These dynamics were common around the Bay Area. 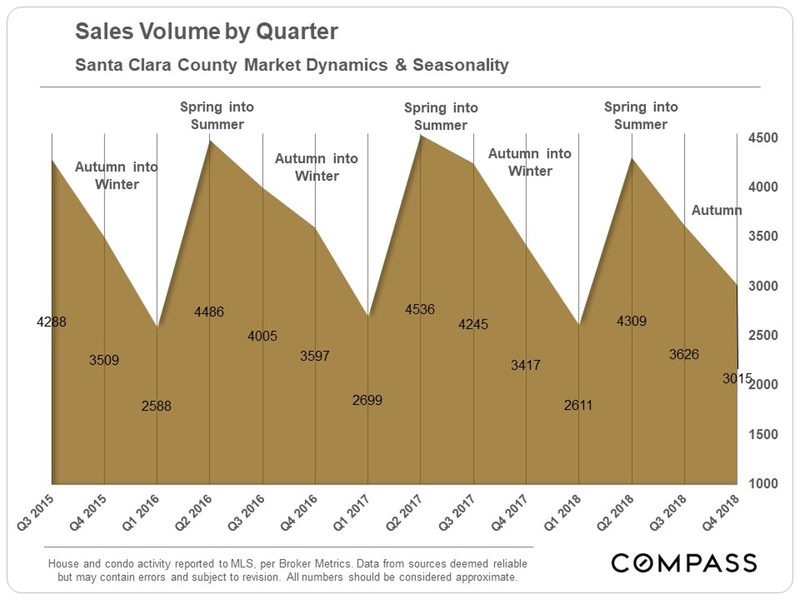 But in summer and autumn, conditions began to change in Santa Clara, and by Q4 2018, the market had cooled so much that the quarterly y-o-y appreciation rate turned slightly negative. Note that one should not come to definitive conclusions about the future based on one quarter’s data. 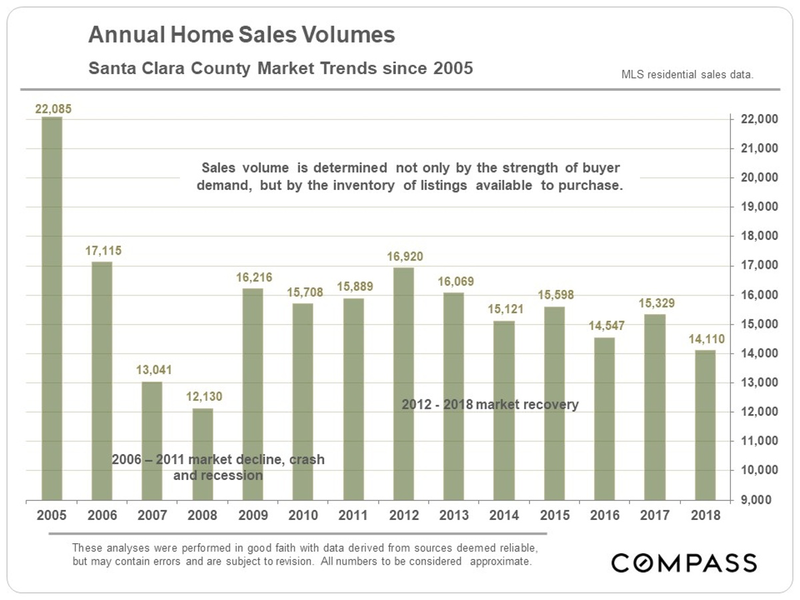 It’s fascinating to see the scale of change in the ebb and flow of home sales in the county over the past 12 years. One of the larger dynamics in recent years is that, on average, homeowners are staying in their homes much longer (before selling) than in the past, reducing the number of listings on the market. Of course, if buyer demand plunges, as it did in 2007 and 2008, that also leads to a plunge in sales. 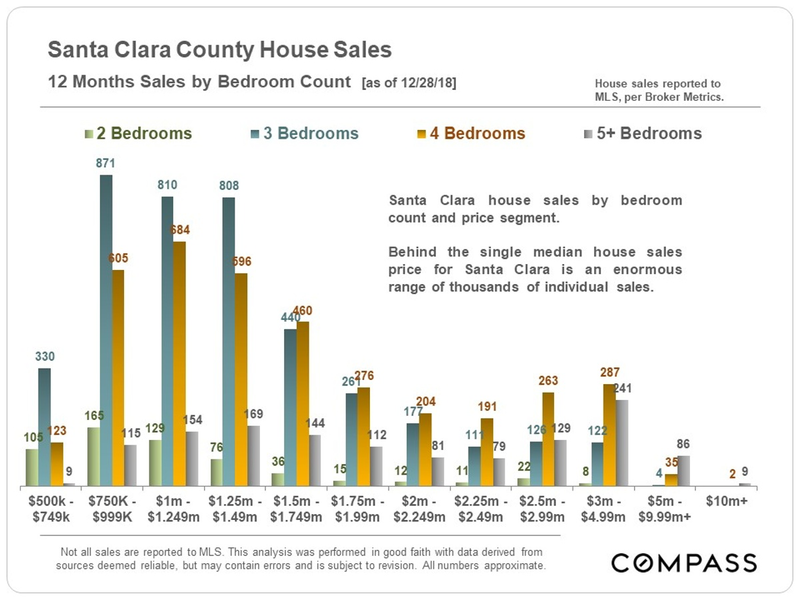 San Jose is, of course, the elephant in the room as far as the quantity of sales is concerned. In the below chart and tables, we broke out a few of its neighborhoods instead of the city as a whole. 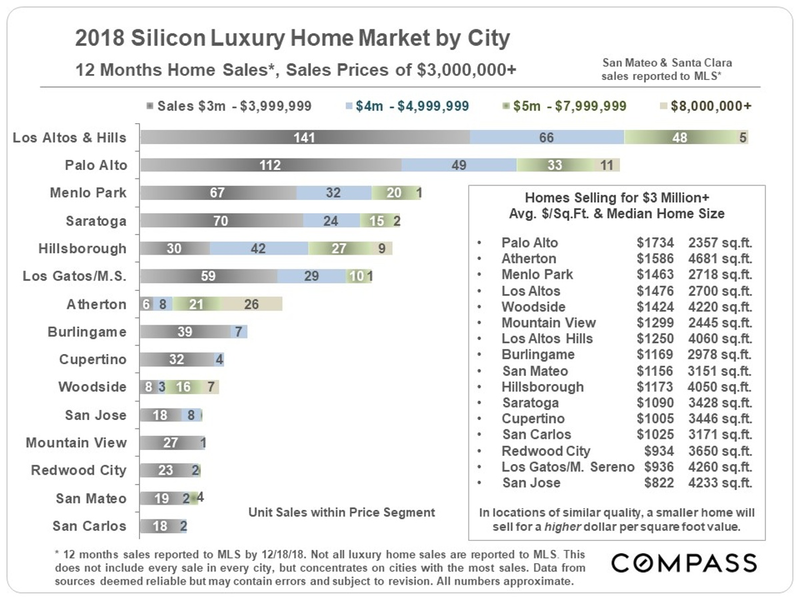 Silicon Valley has the largest luxury home market in the state. 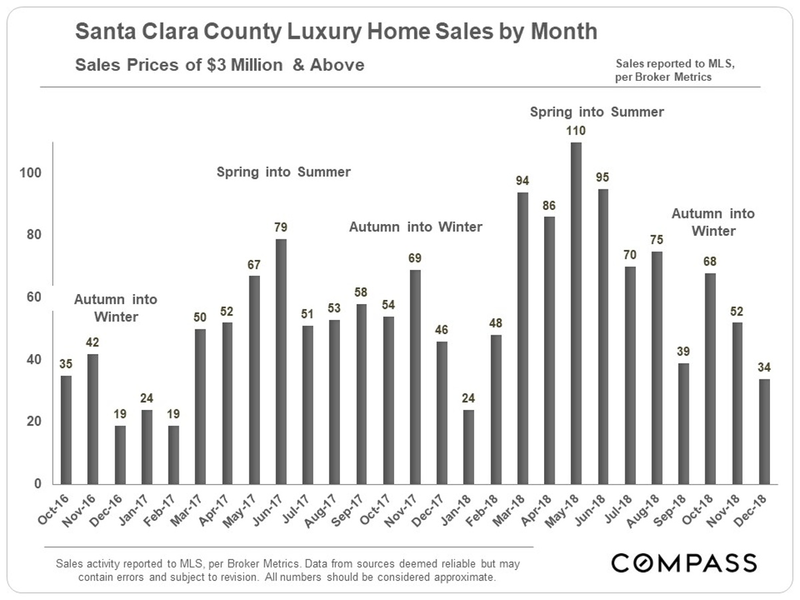 Luxury home sales soared in 2018 through the end of summer, but since September, there was a year-over-year 15% decline in the number of sales. Remember that sales generally reflect market conditions in the previous month, when offers were negotiated and accepted. Many of the market indicators below reflect the huge role seasonality plays in the market, whether measuring inventory or demand. 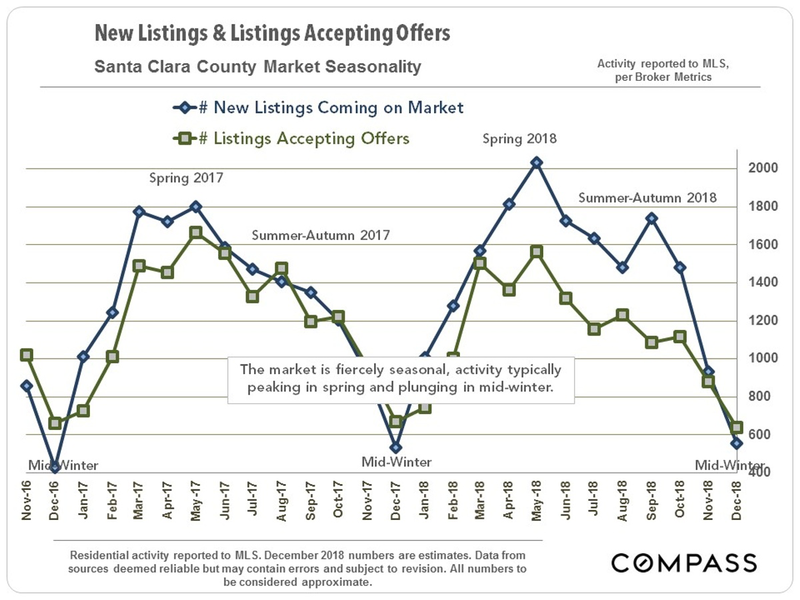 Around the Bay Area, it is not unusual for the market to cool after the heat of the spring selling season, but the scale of some of the recent shifts in market dynamics go well beyond typical seasonal changes. 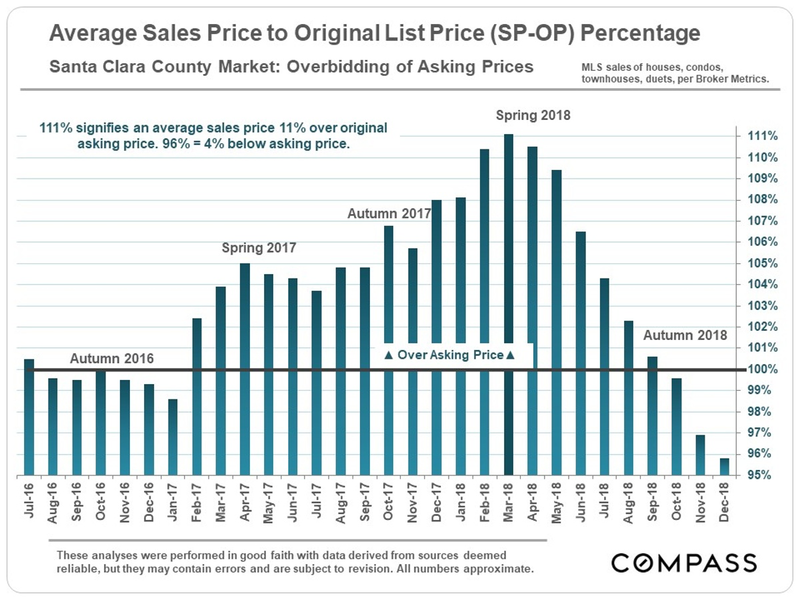 Price reductions and expired, no-sale listings have increased to multi-year highs, and the sales price to original list price percentage – a measure of competition between buyers for new listings – has dropped precipitately. December and January are the two lowest-activity months of the year, and we will probably have to wait until the early spring market begins for more insight into where the market is heading. 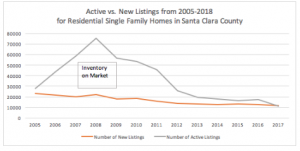 The number of active listings is way up from 2017 – so that the change seems very dramatic to buyers – but inventory is not high by historical measures. The number of sales reported to MLS in the second half of 2018 dropped by about 13% on a year-over-year basis. That’s about 1000 fewer home sales over the 6 months. 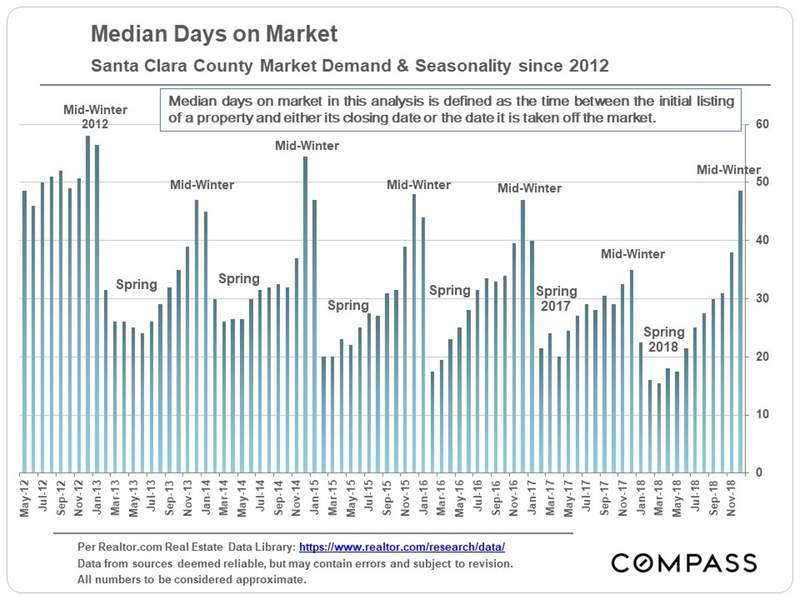 Median days on market are well up from 2017, but again, not yet particularly high by historical measures. 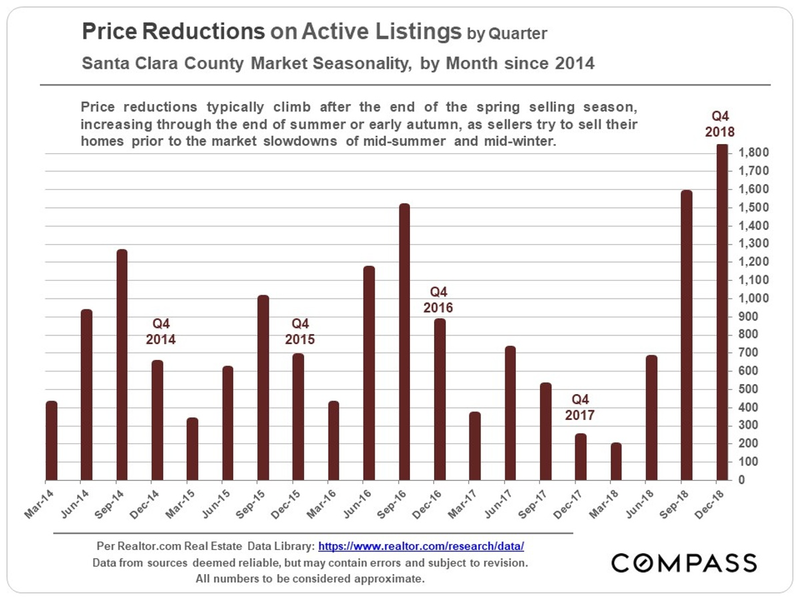 The next 3 indicators reflect some of the clearest changes in the market: Price reductions and expired, no-sale listings are up much higher, and what buyers averaged paying for homes went from 10% to 11% over asking price this past spring, to 3% to 4% under asking price by the end of the year. After climbing significantly through November, interest rates have been dropping through the first week of January – good news for buyers and sellers. However, rates are still much higher than the lows seen in the last few years, and predicting what will happen in the near future is very difficult indeed. 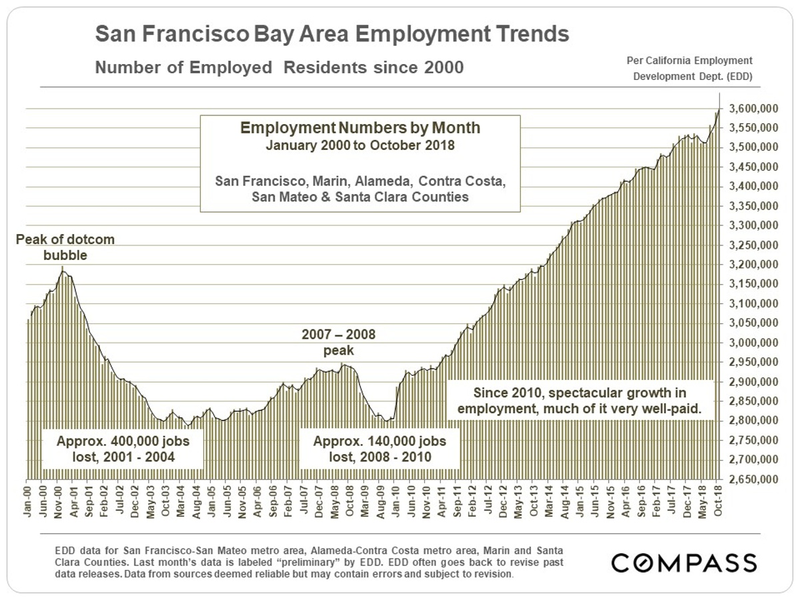 Employment growth – in many cases of very well paid jobs – has continued in Silicon Valley, San Francisco and around the Bay Area. This, of course, is a huge factor in housing markets. The number of active listings and the number of new listings have converged. In previous years, the number of active listings have been a 4-5 times higher than the number of new listings. 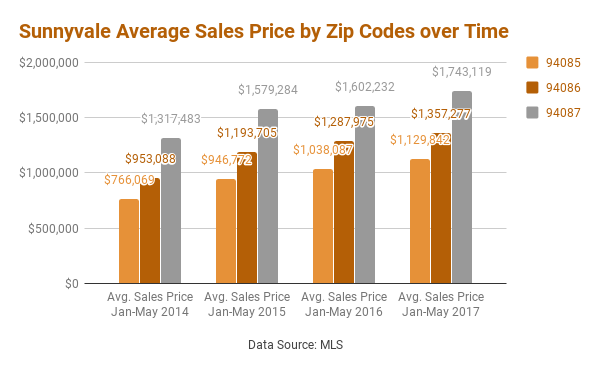 Starting in 2013, however, we have been seeing a steady convergence of active and new listings, and just last year, these two numbers have converged. What does this all mean? This means that homes have been selling faster than ever before even though inventory has stayed fairly consistent. Everyone thinks that the market is really competitive right now because of a low inventory but really it is not due to a lack of supply but rather due to a high demand. It used to be that homes would sit on the market for a very long time before they were sold. 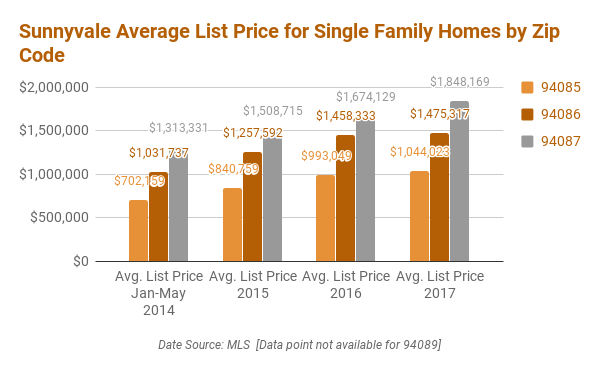 In the recent years from 2013-2018, homes on market have been selling faster than ever. The data on number of days on market confirms the speed sell of homes. 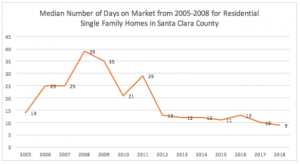 In 2008 the average single family homes in the Santa Clara County spent 39 days on the market. 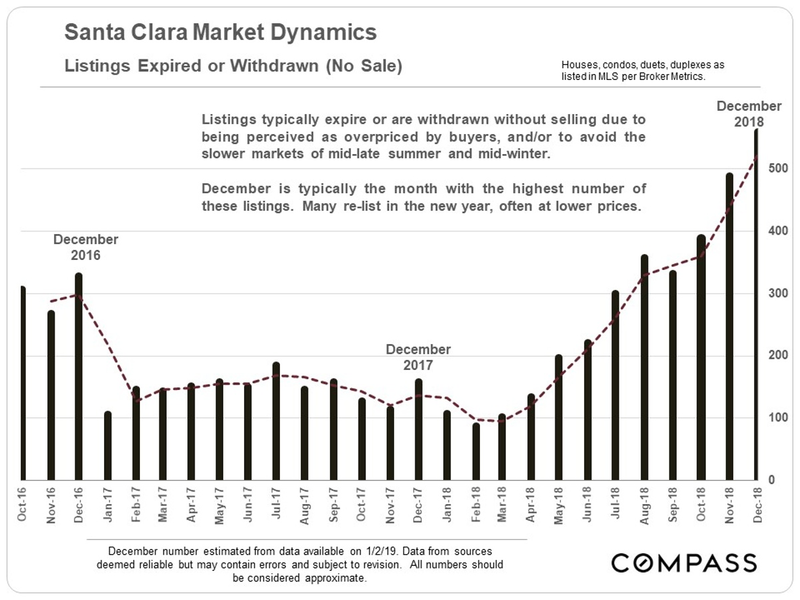 Today Single Family Homes in Santa Clara County spend only 9 days on the market. Since 2012 the median number of days on the market has dropped by more than half. Happy February! As you may remember, during the holiday season the Property Nerds created the first Silicon Valley Housing Sentiment Survey. In it, we asked consumers what they thought about the trajectory of the economy, interest rates, and housing prices, specific to the Bay Area. The results were mixed – opinions were all over the map when asked about the strength of the local economy but one thing that all respondents agreed on is that mortgage rates had nowhere to go but up. 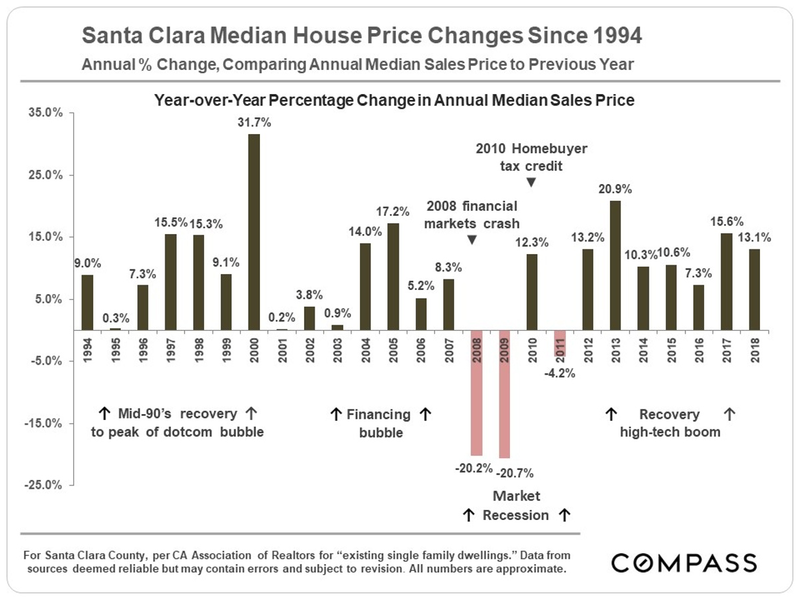 What we also found was that Bay Area residents are “bullish” about our housing prices. Why? The answers become clear in the data below. For question 1, During the next 12 months what do you think will happen to housing prices? 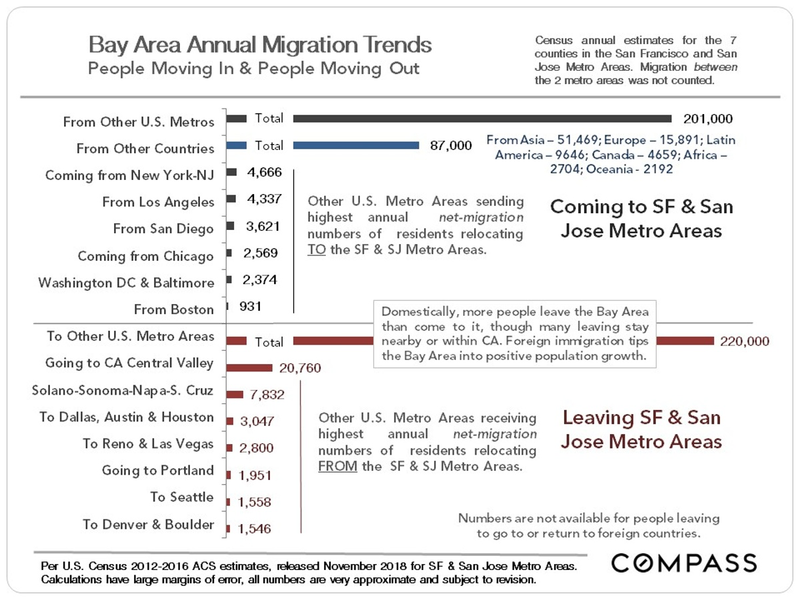 It seems that most people think the Bay Area will continue its upward trend. 60.42% believe that housing prices will go up, 27.08% believe that housing prices will stay the same, and only 12.50% believe that housing prices will go down. We’d like to believe that we will have some more balance in the housing market in 2018 but Silicon Valley’s job growth and lack of housing is insulating us from the cyclical downturn that may start to happen in other areas in the country. For question 2, What do you think will happen to interest rates in the next 12 months? We found that 74.47% believe that interest rates will go up, 21.28% believe that they will stay the same, and 4.26% believe that they will go down. 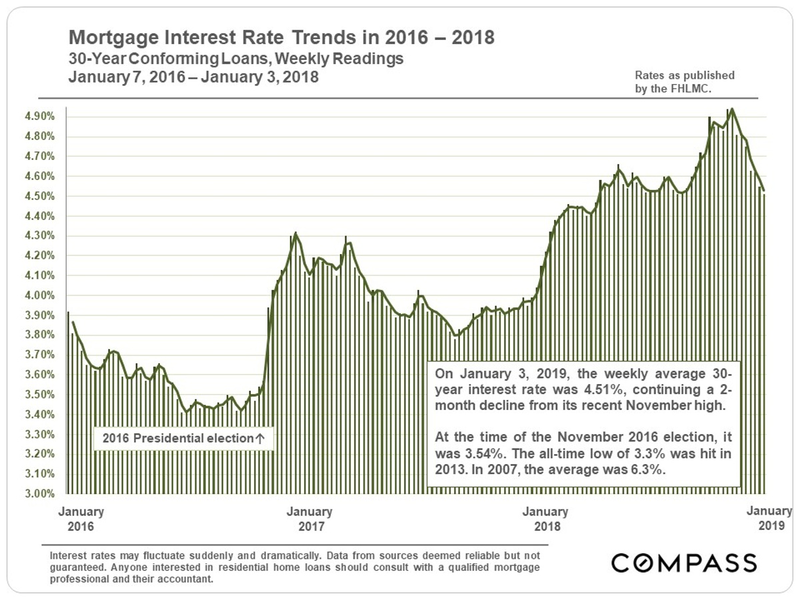 Though we have seen a February adjustment in the stock market, we have already seen a steady uptick in interest rates in 2018. As long as the economy is growing, the fed will have no choice but to gradually increase the cost of borrowing money. For question 3, What do you think will happen to the economy in the next 12 months? This is where we received interesting results. Although most people think that housing prices and interest rates will rise, it seems that they are uncertain about how the economy as a whole will behave. 36.17% believe the economy will go up, 36.17% believe the economy will stay the same, and 27.66% believe the economy will go down. This reflects the uncertainty in our country right now. From the new tax policies to foreign policy to who will be in the White House at the end of 2018, this year looks to be a year of volatility and change. So what is the word on the street on the “front lines” of real estate? We have heard complaints and concerns from our current and potential clients about how the new tax policies affect them, but we haven’t seen a concurrent ebb in the market, except in the luxury properties above $5 million. Will any of these factors help with our supply dilemma and encourage more people to sell their homes? And how will the new tax law affect the supply and demand of housing in the bay area in the long term? We look forward to our future blog posts that will go into depth about these questions from the Property Nerds! Can you remember why the Nerds moved to Silicon Valley? 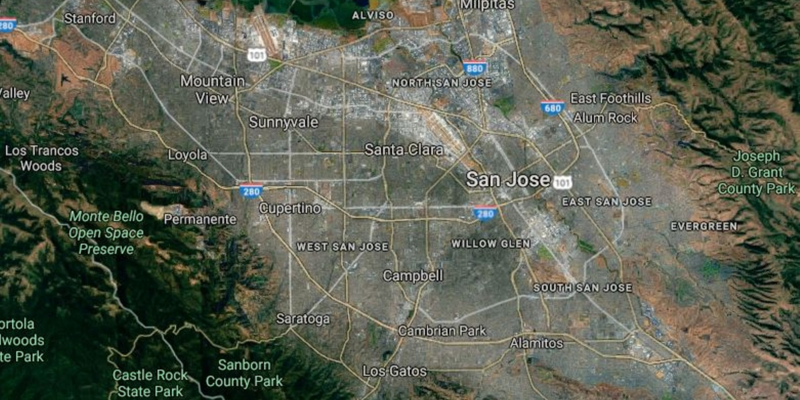 When we were kids growing up in the Silicon Valley in the 1970s, cherry and apricot orchards dotted Santa Clara County back then it was known by many as the the Valley of Heart’s Delight. There was no 85 freeway, Santana Row or Great America Parkway; and it was filled with your classic, middle-class neighborhoods. Everyone drove station wagons with the fake wood paneling and ran into their neighbors while shopping at the Milk Pail Market, or having dinner at Chef Chu’s. We’d never heard of sushi or yoga. Our Mom’s didn’t get “blowouts,” but got their hair washed and set by someone named Gladys at the downtown beauty shop. For fun, we drove up to Redwood City to see Shamu the whale in the pond in front of what is today Oracle. Ohhh…the old days when Shoreline was a drive-in movie theater AND the city dump, and we rode the bus to the Old Mill and watched Star Wars six times in a row. We have such fond memories of the Menu tree (where we got to choose from Chinese, Greek, Italian, Mexican cuisine and more under one roof), Pizza & Pipes (yes, they had organs playing at a pizza parlor), Bob’s Big Boy, The Peppermill, and birthday fun like the world famous Farrell’s Zoo. Sure, there were a few companies in the Valley that would change the world, like Apple and Intel. But at the time we were running around in the hills of Los Altos, Silicon Valley was mostly known for fruit and lots of it. And no one who lived here really saw it coming – kind of like the Trump presidency. 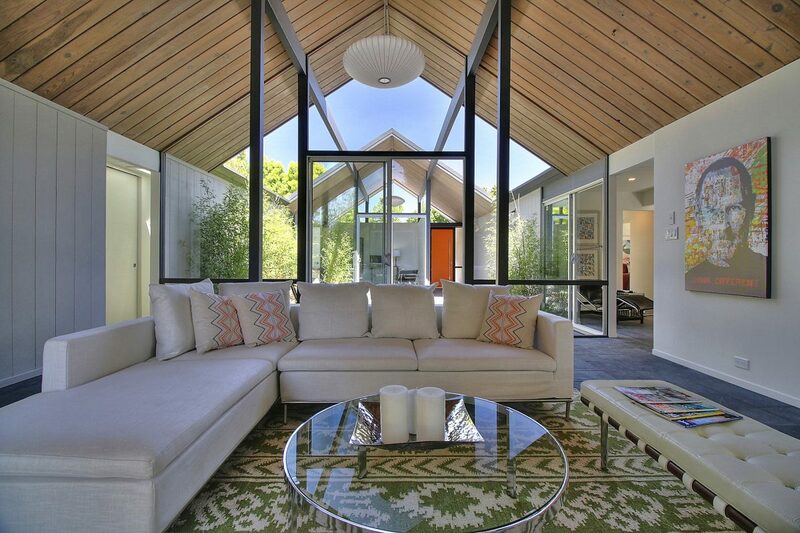 Who could ever think that Mrs. Lee’s’ avocado green house — three bedroom, two bath, flat-roofed Eichler down the block from Mom’s — would one day sell for $2.63 million because someone started calling them “mid-mod’s” and doing spreads on them in Dwell magazine? Or that a 1968 apartment building that looks like a concrete bunker would sell a 2 BR condo with multiple offers for over $1.2 million. These days, Silicon Valley is still our home, and we have grown right along with it. We’ve adapted to the high-speed start-up culture with its Iphones, twitter feeds and car-charging stations. We work with original homeowners cashing out and retiring to Tahoe, move-up buyers whose quaint little bungalows have outgrown their appeal (and closet space), and our favorite, wide-eyed first-time buyers who have no idea what they are doing though they are about to undertake the largest financial decision of their lives. These people all have something in common. The common denominator is that they know we care and we can engineer their happiness. We wake up in the morning and instead of thinking, “how can we make money,” we think, how can we help our clients on their journey? In general, we look at real estate like solving a Rubik’s Cube. In any transaction, there are a ton of moving parts, and getting them to line up correctly is the key. We are that nerdy kid in our Algebra Class who knew the patterns and solved the cube right away. We can take the guess work out of real estate, make you feel confident and give great attention to detail. For us, real estate is more than a livelihood. It’s a responsibility. We know our neighborhoods and if you are a Birkenstock-wearing family of community gardeners, we’d never put you in the Country Club where all the neighbors drive Audi Q7s with a Labradoodle slobbering out the window. We also respect your budget. Though your lender may be saying you can spend $2 Million, we don’t want you wake up in your new home in a pool of cold sweat over your mortgage payment. In practice, we’re property nerds of the first degree. We’re not satisfied until we know everything about everything. We’re nosy, demanding and never settle for less than the best interest of our clients. So if you need to know about a neighborhood, school, new development, commute route, walk score or even a specific property, chances are we’ve seen it, bought it, toured it, sold it or are thinking of investing in it (or want to help you do the same). We do our homework so let us collaborate with you to help you unlock homeownership. Author www-boyenga-comPosted on July 24, 2017 July 26, 2017 Categories Property NerdsLeave a comment on Can you remember why the Nerds moved to Silicon Valley? It is increasingly becoming common knowledge that Palo Alto is the epicenter of real estate in the Bay Area. The closer you get to it, the more expensive the prices get. This is nothing new for many Silicon Valley residents and even most newcomers. In a natural progression, those priced out of Palo Alto move to surrounding cities and thus the outward expansion of desirable real estate begins. Additionally, the momentum of today’s biggest tech companies has brought thousands of jobs and consequently thousands of new residents to Silicon Valley. Along with new residents and rising prices comes impressive development. One city whose real estate has transformed into a hub of seductive sanctuaries is Sunnyvale. If you look at the statistics over the past three years, there are a variety of analytical avenues to pursue. To give you the digestible version of seemingly endless amounts of data, we’ve provided some hot points. 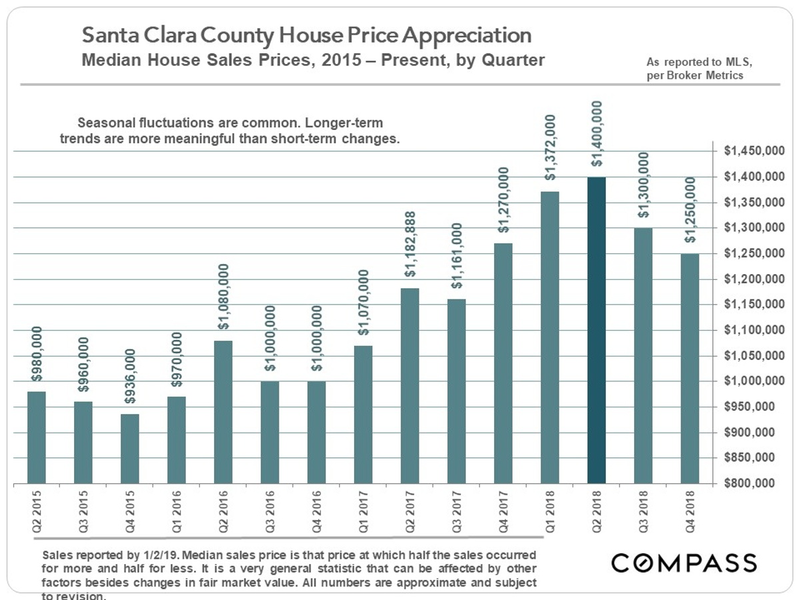 First and foremost the average sales price of homes in Sunnyvale has risen by $400,000 in the past three years, moving from ~$1 million to ~$1.4 million. That’s impressive. Now, let’s give you a closer look at recent history. Within the past three years, both list and sales prices have been steadily increasing. Sunnyvale is hot, and this has been reflected in our field experience. There have been several situations where our buyers have gone up against a multitude of offers on a property that ends up selling a few hundred thousand dollars over asking. So, pardon us, Sunnyvale is really hot. 2017 is no different. It is on an upward trend, and still rising. On the other hand, supply is extremely limited. It is the lowest it has been in the past three years, and its scarcity has been amplifying the multiple offer situations. 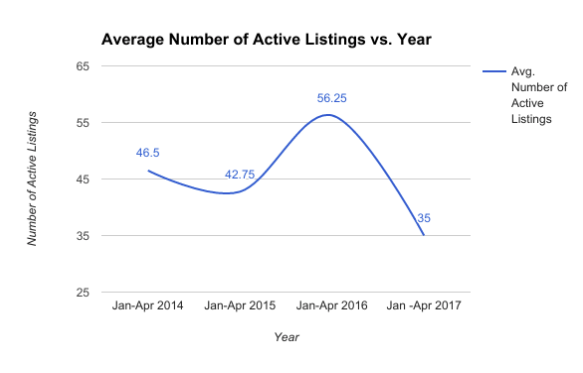 On average, the number of active listings is 20 fewer than last year. With high demand and short supply, the competition has gotten fierce. So how does one break this all down? Well, a few ways. If you bought in August of last year, well done. If you just sold your home last month, well done. Compliments aside, the aforementioned desirability has been reflected in its housing prices. While there are ups and downs, they’re really more like highs and a-little-less-highs. Sunnyvale is experiencing record sales in record speeds, and we’re here to help guide you through it. Have any questions? Ask away, we’d love to help! 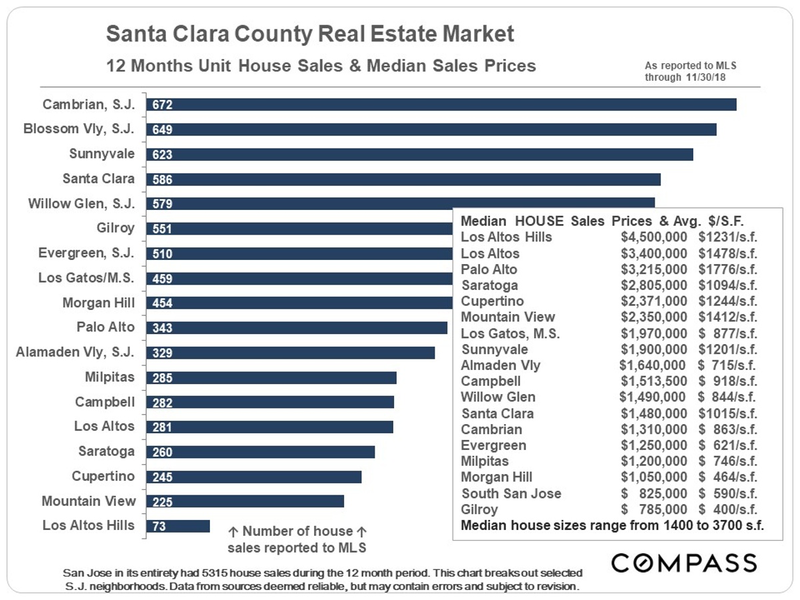 Property Nerds crunch Silicon Valley’s home sales data with a new index! The Property Nerds at the Boyenga Team are pleased to welcome a new nerd to the team, Meiyi Cheng. Having graduated from MIT with a bachelor’s degree in Management Science, we are thrilled to have her join us and provide in depth analysis into the Silicon Valley real estate market. This market we are immersed in is always changing (for better or worse), and it is imperative to have someone on our team who will be able to analyze trends and data. As the first real estate team in the nation to utilize a data scientist to dig deeper into the Silicon Valley real estate market, here’s what you can expect going f orward. Meiyi will be developing the first Home Sale Index focused entirely on Silicon Valley. 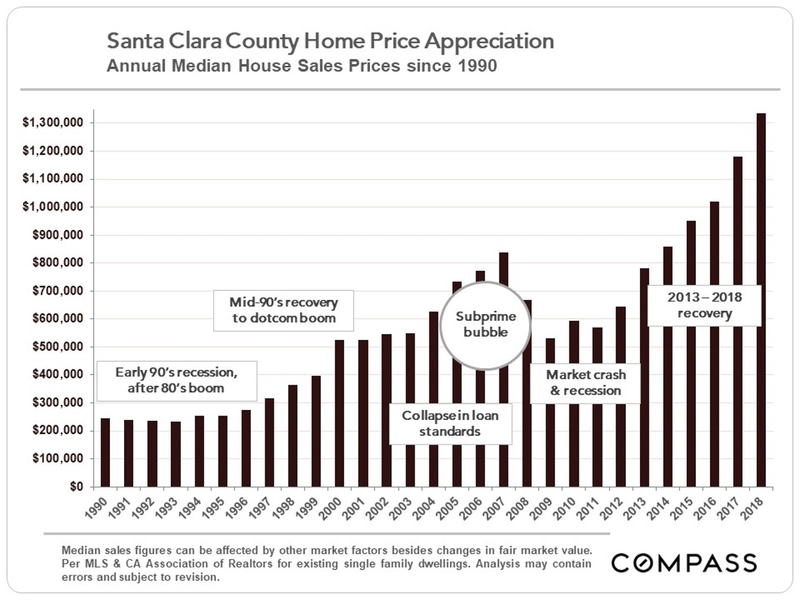 The new index will be known as the Property Nerds Silicon Valley Home Sales Index. It is being developed to keep consumers, agents, and brokers educated and informed about what is happening in the market. Also along with this will be an ongoing segment tailored for those who are interested in deeper analysis of real estate trends in the Bay Area. 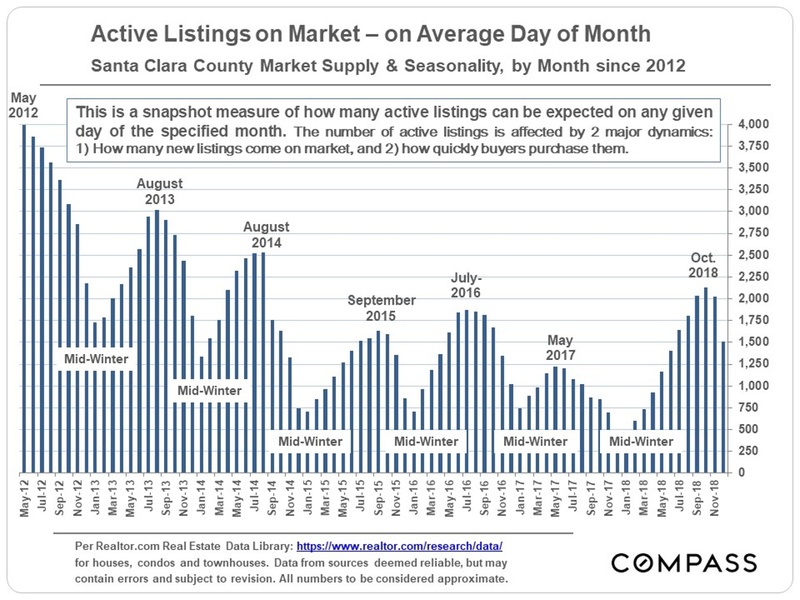 Updated frequently, this will be your one-stop-shop for market conditions updates and news about real estate here in Silicon Valley. Next, we are introducing a new segment called the “Data Dojo”. Within this, Meiyi will be providing consumers, agents, and brokerages with unique insights utilizing complex data points and predictive analytics. Whether it’s a fresh take on standard metrics such as days on market or list vs. sales price, or it’s an inside look into the relationship between two seemingly unrelated data sources, www.ThePropertyNerds.com will be your go-to resource for expert examination of the housing market. You will be able to come here anytime, read, and learn about all we have to share revolving around the real estate industry we love. Lastly, all of our work we will be backed by Meiyi’s expertise as a data scientist to help ensure we are bringing you accurate, relevant, and informative data. 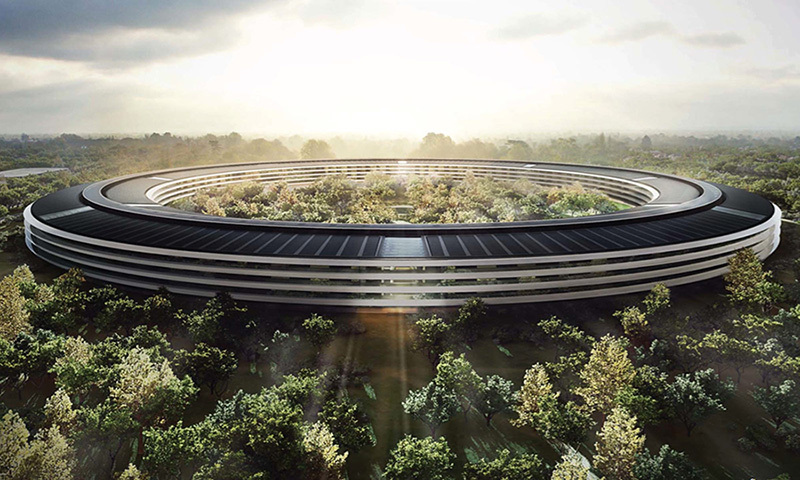 Through this, we will offer consumers the full breadth of Silicon Valley real estate experience. With over a century of combined real estate experience our team can offer our clients a stress free and predictable real estate journey. If you’d like guidance navigating through the sale or purchase of a home, we are here to help. Contact the Property Nerds at Boyenga Team to find out how we can engineer your real estate happiness. Author www-boyenga-comPosted on June 19, 2017 July 24, 2017 Categories Boyenga Team, Market ConditionsTags boyenga team, data mining, home buyers, home index, home sales, home sellers, real estate, silicon valley, silicon valley home sales index, silicon valley real estateLeave a comment on Property Nerds crunch Silicon Valley’s home sales data with a new index! Eichler Weekend Event with The Boyenga Team!